I spent the whole week working with a group of business people from the US. I was their interpreter. They were on an extremely tight schedule, visiting half a dozen customers or prospects each day. We hardly found the time to even have lunch. Then, one of the gentlemen said, “That’s okay, we’ll just grab a sandwich”. I liked that expression, “grab a sandwich”. Are you familiar with the expression? If you grab food, you get some food quickly because you are busy. Let me give you some more example sentences. Let’s grab a bite to eat. Do we have time to grab some breakfast? Let me grab a cup of coffee. You can grab sleep, too. If you grab sleep instead of food, you sleep for a shot time. For example, a working student may grab a nap between classes. Let’s just grab a sandwich. 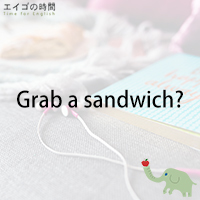 Next Post 一口ちょーだい – Can I have a bite?